Discipline is one of the essential qualities needed to make progress in the game of golf. It is one thing to teach beginners the fundamentals, quite another to ensure that they stick to them. The chief culprit in this respect is over-confidence. A pupil may be progressing nicely and then, suddenly, their game begins to deteriorate. What's going wrong? All too often they think they know the game, become lazy in applying the lessons they have learned, and before long they are back to square one. That is why it is vitally important to repeat techniques until they become second nature. 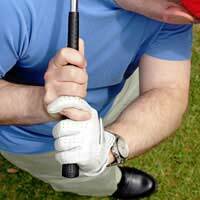 This situation can arise all too frequently in the way a player grips the club. Whether they have decided to adopt the interlocking, double-fisted, overlapping, or Vardon, grip, the principle remains the same. Do not deviate from what you have learned or things will go wrong. Incidences of lazy technique in this area often manifest themselves in poor shots such as the hook or slice where incorrect handling of the club results in the club face making poor contact with the ball. So before even thinking about where you want to put the ball, take hold of the club in the same way you did when you first learned your grip and don't allow the hands to slip too far round the club, a mistake often referred to as a weak grip. Your performance may also be suffering because you are holding the club too tightly. This may only be happening on pressure shots - and, yes, even the humble amateur can feel the pressure in their anxiety to record as good a score as possible - or it may be a bad habit that you have slipped in to. Remember that a light but firm amount of pressure is all that is needed, otherwise you are only going to impede the swing of the club. If the source of the problem is frustration at a lack of yardage, one solution may be to head off to the gym and build up the muscles in your forearms. This will also build confidence in yourself that you possess the physical power to hit the ball hard and allow you to relax your grip. In terms of equipment, you may decide that investing in a glove to wear on the leading hand will bring improvement. Some players even wear a pair of gloves. Those who favour a glove, or gloves, believe there is a benefit in terms of feeling they are gaining a secure hold of the club, especially if perspiration can sometimes be a problem. However, there are many players who feel that a glove makes absolutely no difference and are merely a golfing fashion statement. On this point, it's very much a matter of personal choice. But crucially, whatever the effectiveness of a glove, if wearing one improves your game, then go right ahead and keep on using it. Just make sure it is of the right size, and if your wallet or purse allows, buy more than one to wear on alternate rounds. This will double the life of each glove but more importantly will deliver a similar feel on the club over a longer period as each glove is worn in at the same rate.